The majestic 15th green at Ireland's Westport Golf Club. “No doubt about it,” echoes club captain Martin Gillen. “No matter where you are on this course, you’re on the sea or on Clew Bay.” There are still trees, although few that obstruct the view, and many testify to their coastal exposure by leaning inland like tipping dominoes. “We trim them every year,” grounds chairman Michael Reddington says of the blown-back trees, “to put them back in balance.” Balance describes par-73 Westport to a tee. The opening holes, roughly 250 feet above the bay, are conventionally parkland until the par-5 7th, which slides down to a sheltered valley strewn with old stone walls, ponds and streams. Several holes later, at the 231-yard, par-3 12th, the course takes flight with a shot from a pinnacle tee down, down, down to a bunkered green at bay’s edge. “The 12th can be anything from a 5-iron to a driver,” says committeeman Vincent Farrell, conceding that the former is less likely than the latter. Soon comes the shore-clinging 15th, described by 2014 European Ryder Cup captain Paul McGinley as “one of my favorite par 5s in the world.” The drive, across a saltwater inlet, is intimidating enough, but the real trouble is the fairway, which bends and cants left toward deep rough and a boundary fence stretching to the green. The tidal marsh is a golf-ball magnet, but there is some consolation in the up-close view of Croagh Patrick. Every July, on “Reek Sunday,” tens of thousands of Catholic pilgrims, some barefooted, climb the mountain and attend outdoor mass to commemorate Saint Patrick’s forty-day fast on the mountain in the year 441. Double-bogey, against that 1,500-year record of collective penance, doesn’t seem so bad. That said, it’s time to confess: I am a links snob. For three decades I have cranked out books and articles — all sincere! — celebrating the treeless brand of golf, the game played amidst marram grass, water dropworts and gorse. Parkland golf I have given short shrift, and Irish parkland golf I have flat-out ignored. But if I have given readers the impression that these courses should not be on their itineraries, I beg them now to reconsider. A foursome putts on Westport Golf Club's 9th hole. Druids Glen, south of Dublin, is the Augusta National of Ireland and a four-time Irish Open venue. 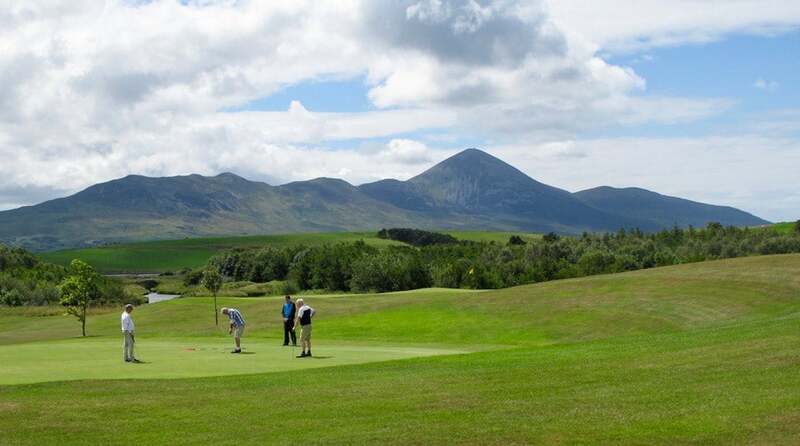 The Killarney Golf & Fishing Club and Northern Ireland’s Lough Earn Resort, with 45 and 36 holes respectively, are transcendently beautiful lakeside tracks. Limerick’s Adare Manor course, recently rebuilt by Tom Fazio, is the centerpiece of a five-star castle hotel and golf resort. Throw in County Monaghan’s Concra Wood Golf & Country Club (the only course designed by “Himself and Nephew,” Christy O’Connor Sr. & Jr.) and Westmeath’s Glasson Country House Hotel & Golf Club, on the banks of beautiful Lough Ree, and you’ve got a golf excursion to satisfy the most ardent tree hugger. I am, of course, partial to Westport, since I’m the great-grandson of a Mayo man. 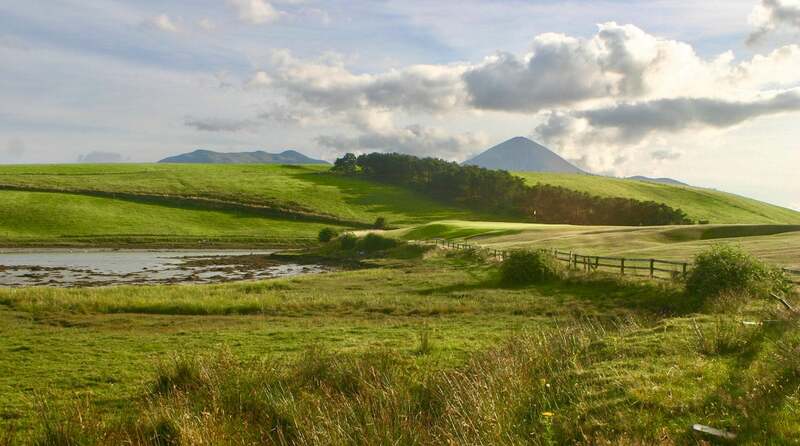 “Most of the links courses are in remote areas, but we have a wonderful town to go with ours,” says Hughes, who bears one of my family’s surnames. Nodding enthusiastically, Vincent Farrell points out that Westport is a three-time national “Tidy Towns” winner and The Irish Times has rated it as the Best Place to Live in Ireland. “There’s pubs with Irish music, there’s restaurants and lots of people, there’s fishing. You can bike to Achill Island and then kayak back — the green way and the blue way!” Next year, Westport GC will host the All-Ireland Cups & Shields Finals, the country’s premier inter-club event. The club has also hosted the Irish Amateur Close Championship (Rory McIlroy won at Westport in 2005); the Smurfit PGA Championship (won in 2002 by McGinley, who shot a course-record 65); the Ladies’ Homes Internationals (won by England in1989); and the Irish Ladies Close Championship (won in 2008 by Leona Maguire, who beat her twin sister Lisa in the final.) And that’s leaving out the roughly 10,000 foreign visitors who played Westport in 2017 — including an American duffer named Joe Biden. “I met a group in the locker room and got to talking to them,” says captain Gillen. “They had played our great links courses — Carne, Enniscrone, Rosses Point — and Westport was just tacked on. But they were so surprised! They thoroughly enjoyed it and assured me they would be back next year.” As will I, on my annual Irish links trek. There’s nothing wrong with a walk in the park, I’ve decided, as long as you can play your ball.